Roqaya: "I was afraid I wouldn't be able to walk again at first"
Roqaya, 14, was very seriously wounded by a shelling in Syria. Both of her legs had to be amputated at the knee. She didn’t know if she’d ever be able to walk again. But, less than a year later, she’s walking independently again thanks to the donations of our supporters and UK Aid. At first glance, 14-year-old Roqaya looks just like many other teenage girls her age. She’s sitting on the sofa, busily tapping away on a smart phone, scrolling through her Facebook feed. She’s wearing trendy jeans and trainers. She could be a teenager anywhere. In fact, she’s in a village in northern Jordan, just a couple of miles or so from the border with Syria. She’s one of the more than 600,000 Syrian refugees in Jordan. When she talks, she’s slightly giggly at first; again, so far, so normal. But when you realise what she’s talking about, and what happened to her, it’s remarkable that she’s so composed and confident. It’s remarkable that she’s even here. “My mum and I were at home, talking on the phone, when a shell exploded nearby”, she says quietly. “Mum was killed and I was injured”. Roqaya’s matter-of-fact recounting of what happened makes it sound ordinary. She’d actually been very seriously wounded. Both of her legs had to be amputated at the knee. She didn’t know if she’d ever be able to walk again. She was evacuated across the nearby border into northern Jordan. Not long after she‘d had initial treatment in a Jordan hospital, she was referred to Humanity & Inclusion, which is supported by UK aid. HI physiotherapists visited her in hospital and started supporting her recovery, providing physiotherapy sessions and arranging custom-made prosthetic legs for her. Now, less than a year later, she’s walking independently again. 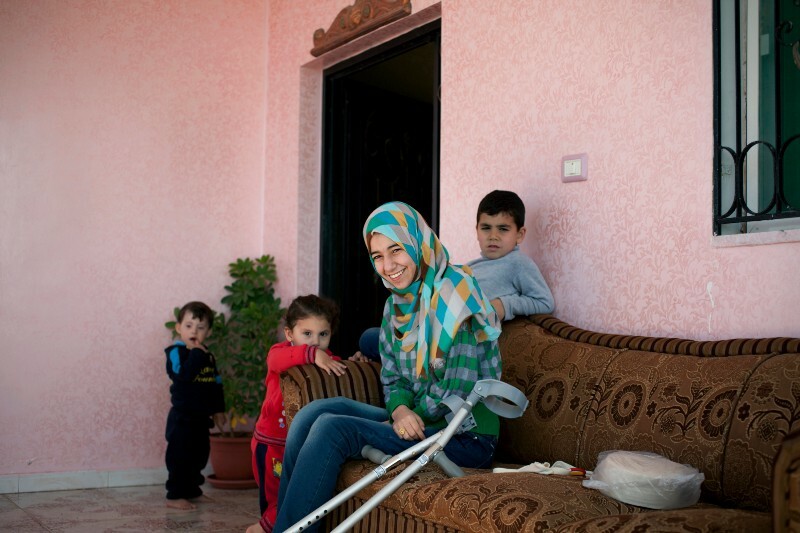 “I was afraid I wouldn’t be able to walk again at first”, says Roqaya. “And then, when I first received my new legs, I was afraid they were too heavy for me.